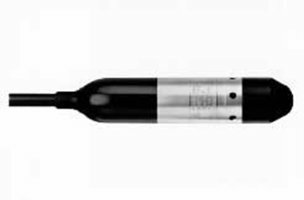 The 280-330 Pressure Transducer (PT) combines a submersible probe, designed specifically for depth and level measurements, with the convenience of an external signal conditioning circuit mounted in a desiccant box. The probe's pressure sensing element is isolated from the water by a titanium diaphragm and the electronics are housed in a titanium body. The PT cable, which is molded to the body, is a thick wall polyurethane jacketed cable with an integral vent tube and Kevlar strain relief cord. An accurate water level measurement requires a dry ambient air pressure reference that the desiccant box provides. The PT is supplied with a can of indicating desiccant that changes from blue to pink when the desiccant bag should be replaced. Both the can and bag are rechargeable.